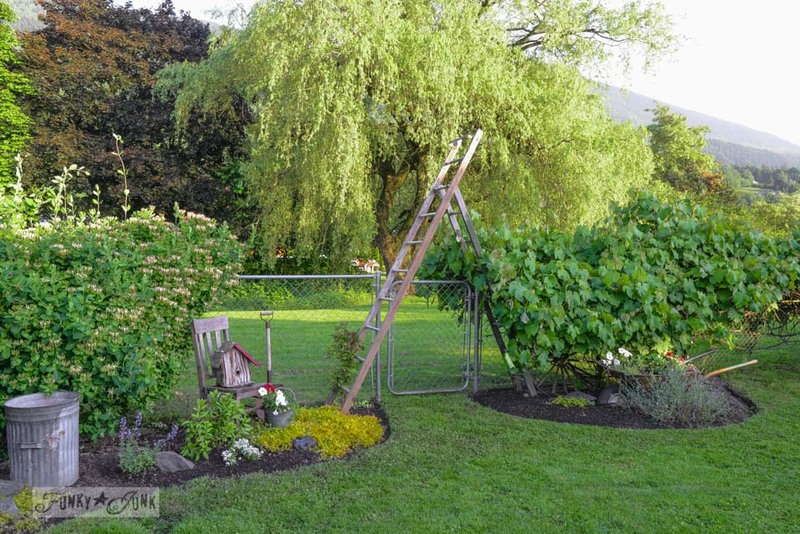 Make an old ladder garden arbour… in minutes! 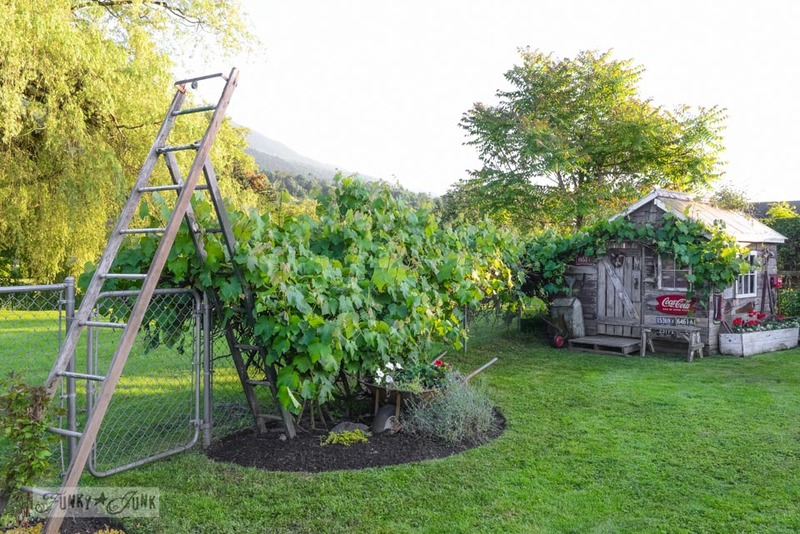 You can make an old ladder garden arbour… in minutes! Yesterday I was continuing my big weed fest in the backyard and had all this apparatus (the usual… sawhorses, pallets.. doesn’t everyone?!) lying all over the place. Including a couple of ladders. Desperately needing a break from pulling weeds in the hot sun, my eyes wandered to the gate. It looked lonely. I’ve never loved the look of a chain link fence much, and had some ideas on how I could jazz it up. BUT I really love looking through it. It’s a killer view out there and there’s rarely people in the park. Hmmm… what could I do to just enhance what was already there instead? So I propped up the ladders on either side of the gate to think. In case you’re wondering, I can walk through it just fine. And if I ever desired a taller opening, I can always find a longer ladder for the right side. 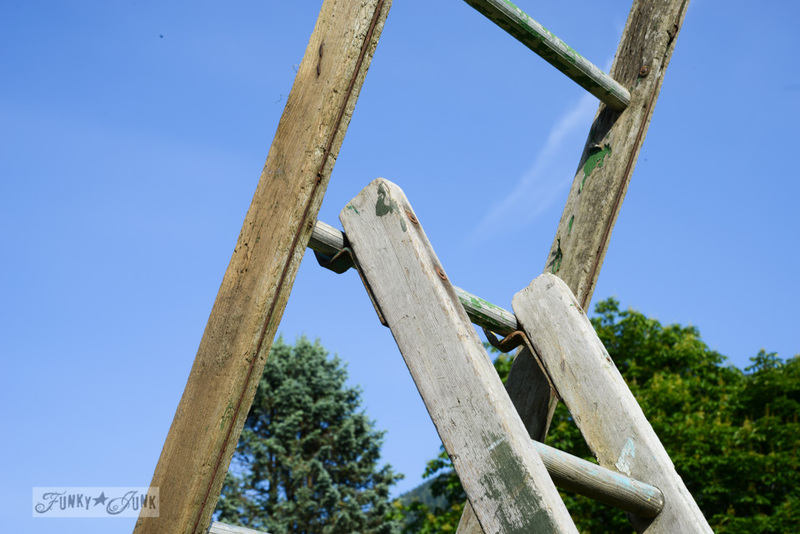 The ladders are attached to the fence with twine. Sturdy as ever. I may get zip strips later, but the twine worked. And now I have a place for the new wisteria! I also planted sweet peas all along the chain link fence. There should be plenty of foliage and colour here one day. Rustic shed, meet your new friend, old ladder arbour. I love this. I did my potting bench like this last year – with boards making the shelves. It was fast and easy. Be careful with the wisteria – it gets very large and heavy you might want to have something larger to support it. I love it! 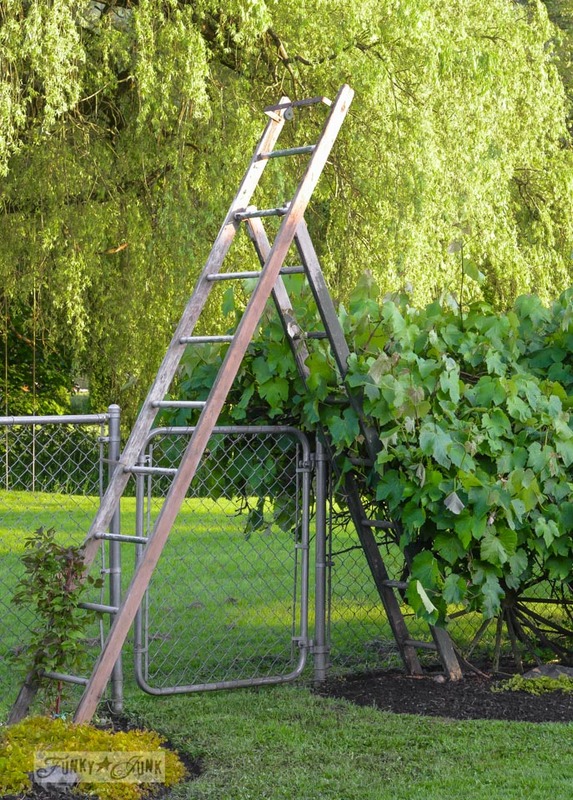 Can’t wait to see what that wisteria looks like all over those ladders! And planting the sweet peas to cover the fence is an awesome idea! I love the way your mind works! Your backyard is just lovely….what a sight to look at every morning over coffee! I love the view and wouldn’t want a privacy fence up, either! Gorgeous with the mountains in the back! Super cute & clever using the ladder like that, Donna. 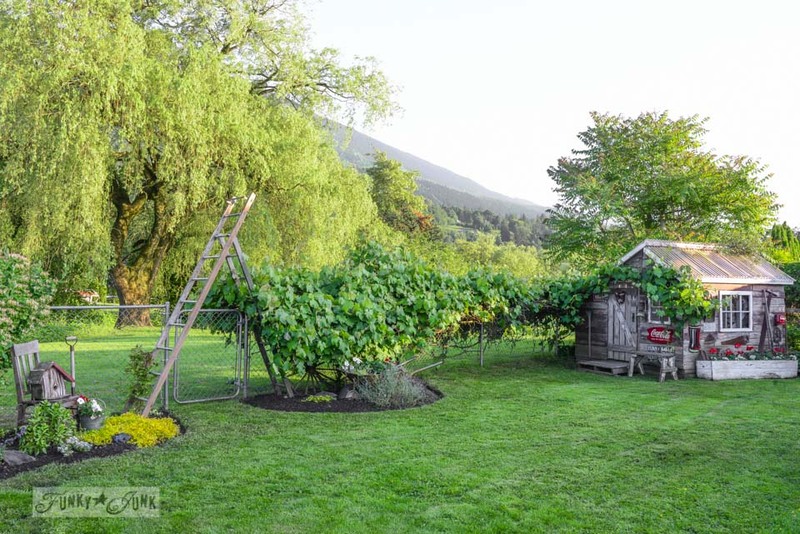 In a year or so, you’re going to need to replace it, though…wisteria gets very large and becomes almost like a tree, the vines are actually trunks and they will devour anything not strong enough to support it. Sorry, but I don’t want to see your ladders get broken! Never thought of that Debbie, thanks! I’m going to move it somewhere else! This looks fabulous! 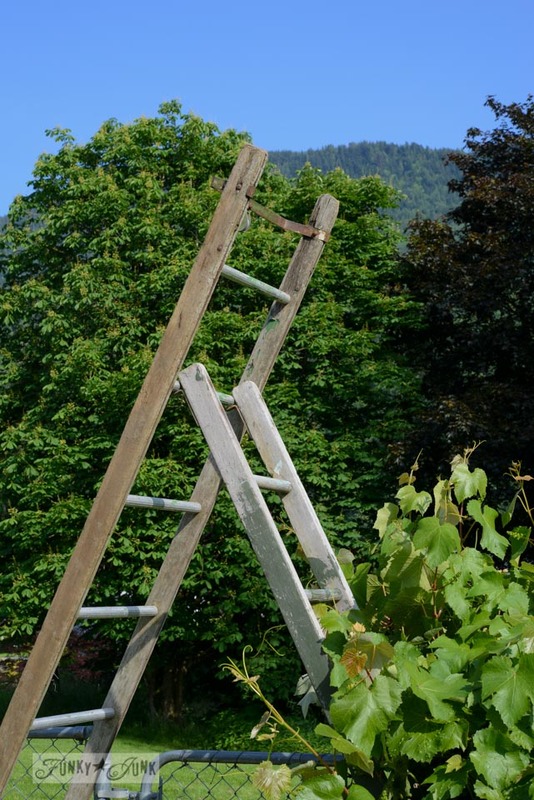 I have an old ladder in my backyard as well and I really like the height it adds to my flower bed. There are so many different ways it can be “dressed” as well! Happy landscaping! How lucky to have such a beautiful park next door. 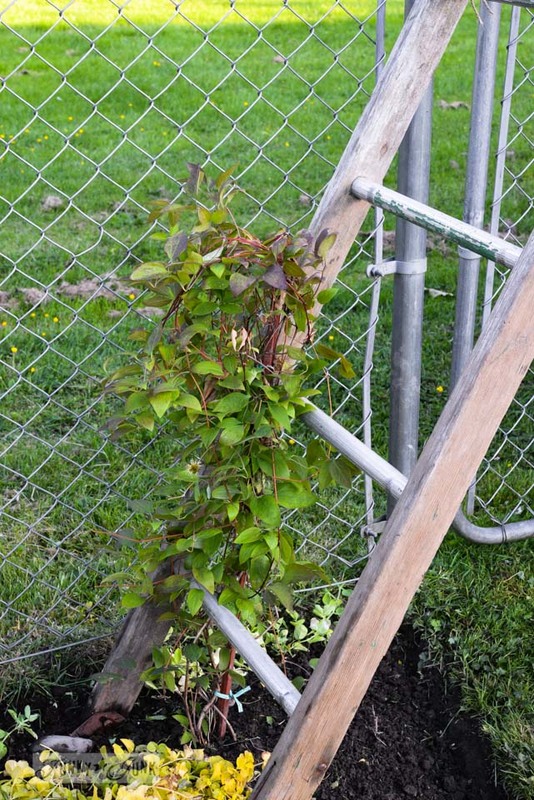 This is going to really be cute when the vines grow up on the ladders…I can tell you are not superstitious! Isn’t it suppose to be bad luck to walk under a laddder? Great idea….as only you can come up with.I love it…Your yard is so pretty. Also, consider a Sweet Autumn Clematis. They can have a lovely scent, are very hardy, and cover all kinds of things without the heavy trunks. The were known as “Castle Climbers” in England, because they’d grow to cover the stone walls. Haha! I like the way your grandma thinks! How cool is that? What a neato idea!! Looks awesome. I think I’d put something else besides Wisteria as it does have a large root as does honeysuckle, cat claw and etc. Surely there is something…maybe Armenian cucumbers, sweet peas would work great as well, and what about Jasmine? Can’t wait to see the growth. Thanks for sharing. 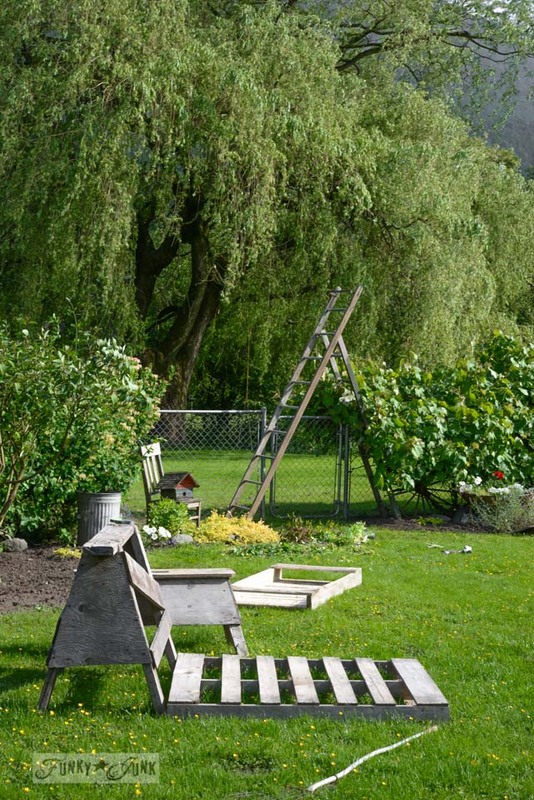 Nice idea, a ladder garden! Looks cool too. You really come up with some great ideas! Thanks for the inspiration! Oh how …… well gorgeous! I can not find words to compliment your beautiful yard. I am ever so jealous too. I wish to someday copy… sigh. Your flower beds look tilled and weedless. Do you work up the ground everything you weed or is this just for the photos? Wow…Such a fabulous gardening view. I enjoyed it. Thanks for sharing this views. What a fantastic look, instead of putting my ladder out I can make my own arbour in my veggie garden. Thanks Jo. Nice to see your contraption! 🙂 It’s going to look great. I have a 12′ step ladder that’s oooollllllddddd. It’s broken on the step side, but can be repaired with mending plates. It’s so wide at the bottom, it almost fills a 4′ space between 2 of the posts at the end of my porch. My plan is to flip it upside down and use the support side as a trellis. It’s like it was made for it! Oh – I found this outside an old bar that was going into new ownership. I think it had probably been there since the 50s when the building was made. They helped me take it away so fast I rode around with it hanging out of my little truck for a week before I could get it unhooked and off in my yard! If you do go to zip ties, make certain to buy the UV resistant ones. I repaired my chain link fence with zip ties, not knowing regular ties would just become brittle and break.